My New Project For 2016!!! Joel Watson (cartoonist from the webcomics HijiNKS ENSUE and Sharksplode and writer/voice actor for Cyanide & Happiness) reviews the first trailer for Batman v. Superman: Dawn of Justice by drawing cartoons directly on the trailer! It’s part review, part reaction, part play by play telestration and all completely hilarious! I’m not 100% done with comics, but I am taking a much needed break from them to recharge and try out some new areas of creativity. If all goes well, this will be the beginning of a new chapter in my career and a new direction for my creative output. Also, I’m working on bringing back the HijiNKS ENSUE Podcast (or rather, A PODCAST called HijiNKS ENSUE) in the next month. Lining up guests now. I decided just to do it, rather than wait for a Patreon goal. I hope you guys enjoy this new stuff. I had a lot of fun making this video. OH! And PLEASE subscribe to the YouTube channel. There are several features that I need that aren’t unlocked until the channel has at least 100 subs. Totally New Patreon Goals and Rewards! I’ve just completely retooled my Patreon rewards and goals based on my new projects (namely Sharksplode), and what I’ve learned over the last year or so. I’ve taken stock of the things I said I wanted to do, then didn’t do (because I didn’t actually want to do them), and the things I’ve always wanted to do but never had the proper motivation for doing (like recording and releasing music). Hopefully the experience I’ve gained and the regret I feel for not reaching every goal I set for myself with Patreon originally will keep me motivated and honest. This might not seem like great news to HijiNKS ENSUE fans. 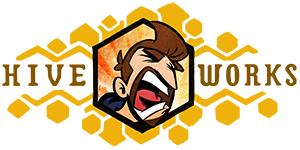 I clearly left out any HE-based rewards in the new Patreon setup, because I honestly don’t know when I’m going to be able to update HE again, or how often. 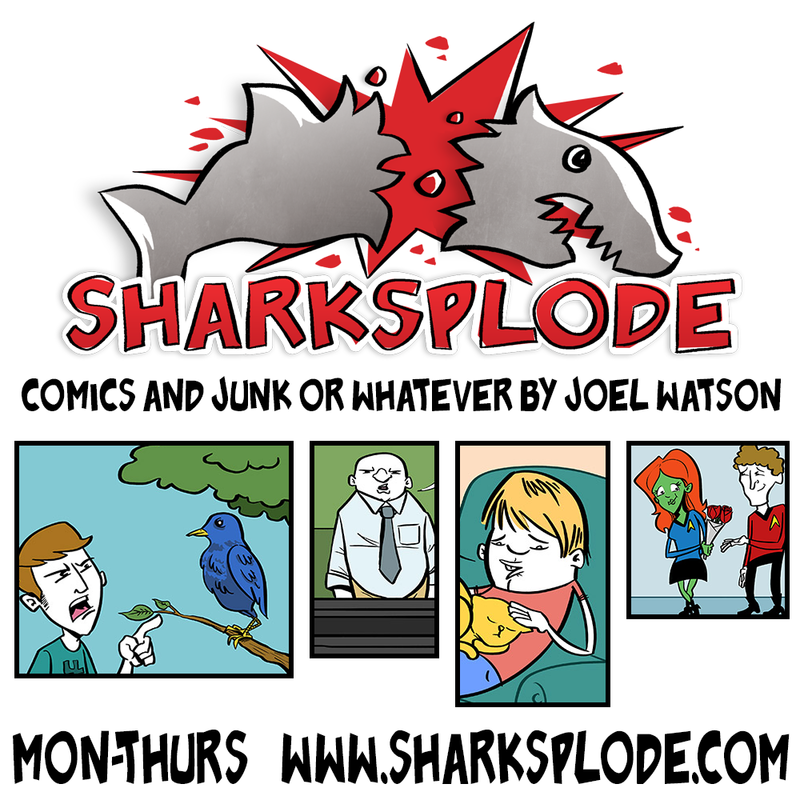 My heart and brain are currently more interested in Sharksplode and I don’t want to force my self to make comics that I’m going to ultimately be disappointed with just because I feel obligated to. I will return to HE and I will finish it the way I want to. That’s the most honest explanation I have for you right now. There’s a ton of new stuff to be excited about and chances are (if you’re already a Patron) I owe you some goodies, so please read all the rewards (http://patreon.com/hijinksensue) and msg me via Patreon if you would like to claim your custom comic print file, mobile desktop or digital commission. 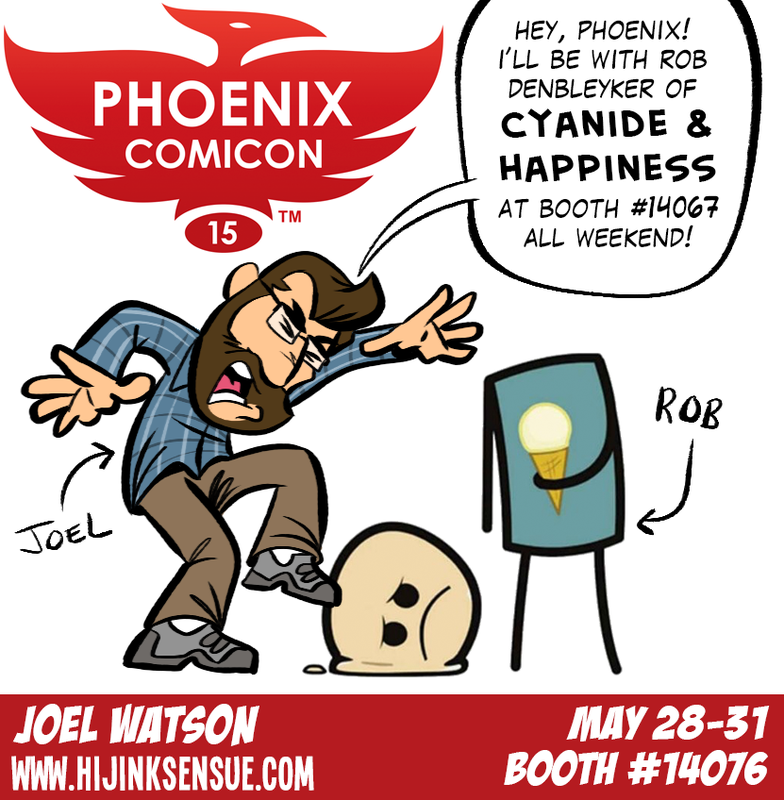 I’m super excited about doing Patron-Only Sharksplode comics, recording a cover song EP, doing a live 90s Alt Rock Challenge concert, and releasing THE LOST HIJINKS ENSUE PODCAST (featuring Kris Wilson of Cyanide & Happiness). Hey, guess what? 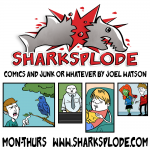 I started a new webcomic called Sharkspode! You might remember the name and URL from the t-shirt site I used to run with my friend Wil. Since all of those shirts were either retired or folded into the HijiNKS ENSUE Store I decided not to let a good, weird URL and a logo featuring an exploding shark go to waste. I’ve posted 4 comics to get you started and there will be a new comic every day this week. After that it will update Monday through Thursday. Please share the site and the comics with your friends on Facebook, Twitter and however else you see fit. It’s a bit scary feeling like I’m starting over from scratch wit zero readers, so every little push in the right direction helps. Make sure to bookmark the site or subscribe to the RSS feed. Enormous thanks to Hiveworks for helping me get the site up and running while I was out of town this weekend and away from my normal tech and reliable internet access. 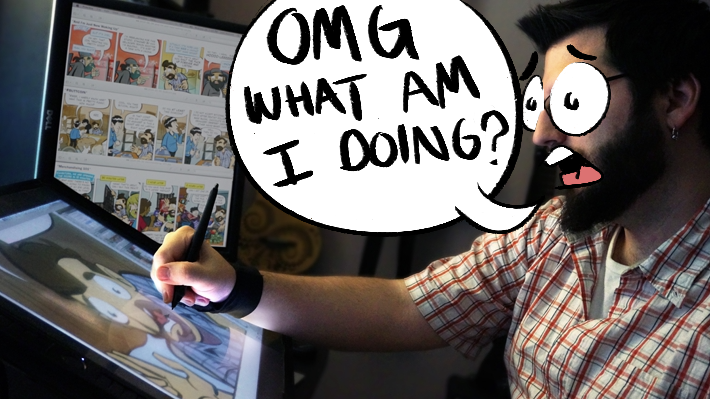 I’ve worked really hard on the comics and this site, and I hope you enjoy them. I have the benefit of 8 years experience making comics to put into this new endeavor, but it is still incredibly young. I expect it will take me a while to really find a voice for Sharksplode and hone in on what exactly I want to do with it. I had planned to launch with 10 comics on day one, but I actually ended up redrawing the first strip from scratch 5 times trying to get the new art style right. Anyway, I an excited and I hope you are excited.